Why does the European Day of Languages matter? 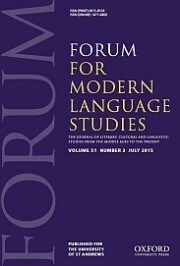 Forum for Modern Language Studies publishes articles on all aspects of literature, linguistics and culture, from the Middle Ages to the present day. The journal aims to reflect the essential pluralism of research in modern languages and to provide a forum for worldwide scholarly discussion. It invites articles in the following subject areas: Arabic, Comparative Literature, English, French, German, Italian, Linguistics, Portuguese, Russian and Spanish. Each year, the European Union celebrates the European Day of Languages on 26 September. To mark this celebration of linguistic diversity, we asked the editors of Forum for Modern Language Studies to tell us why they think people should study some of the major European languages. Where is it spoken? French is an official language in 29 countries of Europe, spoken by over 270 million people across five continents, and the fifth most commonly spoken language worldwide. In North and sub-Saharan Africa, more than 100 million people in over 30 countries speak French, and it is the official language of communities such as the Canadian province of Quebec, and Haiti, where it co-exists with a creole variety, as it does in many islands of the Antilles and Indian Ocean, such as Mauritius and Réunion. Why study French? For centuries, French culture has had a huge influence on the world, including Descartes’ ‘Je pense donc je suis’, enlightenment thinkers Voltaire and Rousseau, the revolutionary ideals of liberté, égalité and fraternité, poets such as Hugo, Baudelaire, Verlaine, and Rimbaud, and philosophers such as Sartre, De Beauvoir, or to Camus. France was the birthplace of the déclaration des droits de l’homme et du citoyen of 1789 and the counter-cultural revolution of May ’68, and its culture still fascinates and provokes in equal measure today, thanks to internationally infamous writers such as Michel Houellebecq. To learn French, and to study French culture in its dizzying variety, is to participate in the ever-evolving linguistic and cultural vitality of our modern world. Where is it spoken? German is spoken in Germany, Austria, large parts of Switzerland, Liechtenstein, and Luxemburg. There are recognised German-speaking minorities in Italy, Belgium, and Denmark. Diaspora communities in Hungary, Romania, Russia, Kazakhstan, the United States, Canada, and many places in Latin America, such as Chile, Paraguay, and Brazil speak German. Yiddish has its roots in German and there is even a creole variety of German spoken in Papua New Guinea, called Unserdeutsch. Why study German? Before we even start talking about economic power, political influence, or Germany’s troubled history in the twentieth century, we can ascertain that there is huge cultural variety and richness within the German speaking sphere. When we add to this picture the recognised language minorities such as Danes and Sorbs in Germany, and Slovenes, Hungarians, and Croatians in Austria we get a sense of the linguistic and cultural diversity of central Europe. Moreover, 12.3% of all German nationals have some kind of background in immigration, whilst 7.7% of the population are foreign nationals who reside in Germany. The German speaking countries therefore sit at the major European crossroads of migration, trade, and cultural exchange. What other reason do you need to study their language(s) and cultures? Where is it spoken? Russian is the seventh most-spoken language in the world and is the most geographically widespread language in Eurasia. It is the official language of Russia, Belarus, Kazakhstan, and Kyrgyzstan, as well as being unofficially but widely spoken in Ukraine, Latvia, Estonia, and Moldova. Why study Russian? Russia today, with a population of some 144 million people, is increasingly influential on the world stage in terms of its politics, economics, art, and culture. It is a nation with a rich artistic and intellectual heritage that includes great writers such as Dostoevsky and Tolstoy, and notable thinkers like Herzen and Berdiaev. Dating back at least as far as the reign of Peter the Great, Russia has enjoyed something of an antagonistic relationship with the rest of the world, Europe especially. And so the study of Russian history, literature, and culture in all of its various iterations provides the opportunity to begin to understand a country that asserts the existence of a multi-polar world and a specifically Russian way of doing things. Current research in the broad area of Russian studies includes but is not limited to literature and art from medieval times to the present; issues in cultural memory and memory studies; reassessments of the structure and functioning of Soviet-era Russian society, especially under Stalin; Russian thought and intellectual history; manifestations of Russian nationalism; environment studies and ecocriticism; comparative studies between Russian literature and other world literatures; film studies; Russian music; and Russian and Soviet orientalism. To learn about Hispanic cultures in all their many manifestations and variations is to gain invaluable insight into the complexity, diversity, and plurality of our contemporary world. Where is it spoken? Spanish, as the fourth most commonly spoken language worldwide, is spoken by some 350 million people around the world, principally in Latin America and Spain, but also increasingly in the United States. By 2050, it is estimated that 30% of the population of the United States will be native Spanish speakers. Why study Spanish? Studying Hispanic cultures worldwide gives a window into the major forces that have shaped and continue to shape our globalized world, with Columbus’s violent irruption into the ancient and mighty native civilizations of the Americas being one of the many symbolic watershed moments of Hispanic history. Current research in Hispanic Studies is going through exciting times. This includes debates about nationhood, identity, and governance within Spain and its autonomous regions; re-examination of the effects of neo-liberalism across Latin America; international literary dialogues between Latin American writers at home and those in European and North American diasporas; the rise of social media and their interaction with new forms of creativity and cyberculture; indigenous movements and issues of territorial and cultural representation; and connections across Hispanic and other language areas on subjects such as ecocriticism, translation studies, and crime fiction, with the novela negra being particularly strong in Spain and Latin America. To learn about Hispanic cultures in all their many manifestations and variations is to gain invaluable insight into the complexity, diversity, and plurality of our contemporary world. Image Credit: ‘Conversation’ by argaplek. Public Domain via Pixabay. Alex Beaumont is a Portfolio Marketing Executive for Oxford University Press.